Misty mornings at Rorke’s Drift Lodge always leave one inspired by days gone by. This week marked yet another new and exciting adventure. We offered, for the first time ever, a colonial bush breakfast. A taste of what the high life would have been like in the 1800’s. Set on the open plains of the battlefields of Africa. How could one not enjoy the vast expanses like these that allow your soul to take flight? 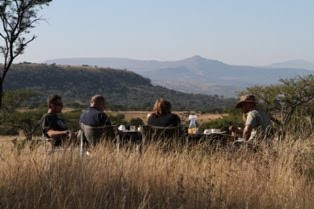 Werner took the guests out for an hour and a half morning horse back safari and was then welcomed by Rika at the breakfast site that they had selected earlier in the week. A full breakfast; spread out with silver and glassware to add the touch of colonialism to the table, helped create the perfect setting for a bush breakfast on the battlefields. As they all tucked into the scrumptious breakfast that was prepared you could hear the earth breathe around you. This is how close you are going to get to experience a moment in the past. After breakfast the guests were escorted back up the Sinqindi Mountain by vehicle making it a truly unique experience for all that joined us!